In a new edition of “You Oughta Know,” we examine the dark and unforgettable world of Oswaldo Guayasamín (Guay-ah-sah-MEEN). Oswaldo Guayasamín was born and raised in Quito, Ecuador. His mother was Mestiza, or of both native and European decent. His father was of native decent. Both parents were decent of the Quechua peoples, a collective group of indigenous Ecuadorians. Guayasamín’s family was poor; Oswaldo was the oldest of ten children. He attended the School of Fine Arts in Quito and also became an activist. In his travels to other Latin American countries he witnessed poverty and oppression which inspired much of his work. These experiences solidified his view of the civilization around him. Guayasamín and his art are not without controversy. He was a communist and a big fan of the Cuban Revolution and its leader, Fidel Castro. He was also anti-USA about a lot of issues. But let’s choose to ignore that right now because you still oughta know about his art. Guayasamín created art to expose humanity’s cruelty, but he also created it to convey the hope for humanity that resides in all of us. Above all, Guayasamín created art for indigenous peoples, in recognition of their suffering throughout history and in hope for their redemption. Click image to enlarge. 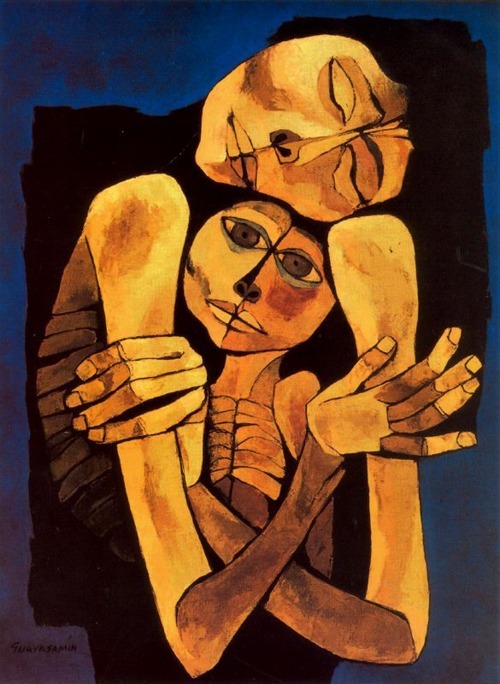 Oswaldo Guayasamin (Ecuadorian), Madre y niño (Mother and Child), 1989. I was introduced to the works of Guayasamín by my sister who studied abroad in Quito during college. Were it not for a family vacation to visit Quito while she lived there, I would probably never have heard of this artist. Though he died in 1999, his legacy lives on through the people of Ecuador for whom his work is a profound source of pride. Prints and replicas of his paintings can be found in every street market and souvenir shop. Guayasamín’s artistic style is often described as expressionist, recalling the German Expressionism of the early 1900’s as well as small Mannerist influences. 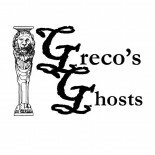 His figures are abstract and recall the gaunt features common of Picasso’s Blue Period as well as the chilling image of Guernica, which Picasso painted after the bombing of Guernica in 1937 during the Spanish Civil War. Click image to enlarge. Pablo Picasso (Spanish), Guernica, 1937, oil on canvas, 349 cm × 776 cm, Museo Reina Sofía, Madrid. Click image to enlarge. 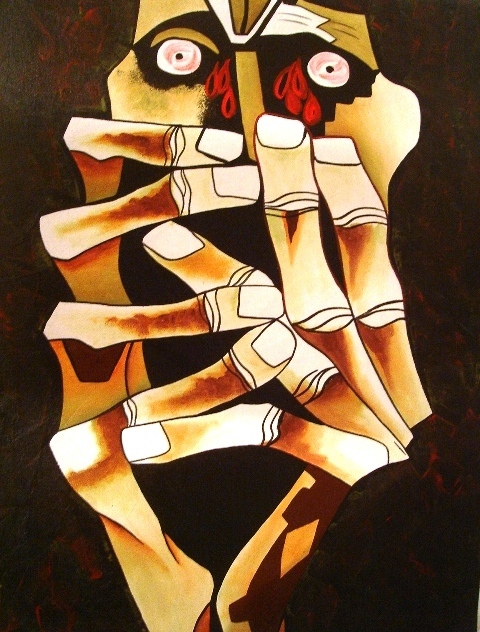 Guayasamin, Los manos de protesta (The Hands of Protest), part series La Edad de Ira (The Age of Fury). 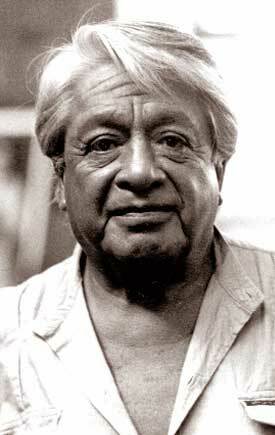 Guayasamín received many awards for his peace efforts and recognition of human suffering and indigenous people in such compelling works of art. His style is not theatrical or three dimensional. He rarely makes use of compositional elements such as backgrounds or even objects. 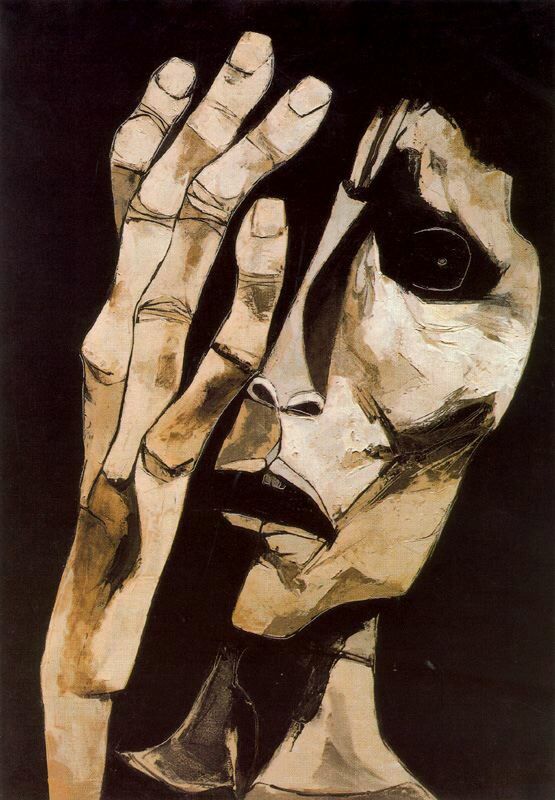 Most of his art is concerns human figures and their expressions alone. Guayasamín does not make much use of color either, most often preferring to let shades of gray, brown and white contrast highly with dark black and blue backgrounds. He creates thick black outlines and rough shading to convey texture and light, like that of an illustrator but on a much larger scale. This creates a bleakness to each composition which further enhances his themes of despair and oppression. Click image to enlarge. Guayasamín, El Grito no. 3 (The Cry No. 3), 1983, oil on canvas, 130 x 90 cm, Fundación Guayasamín. Quito. In the mid 1980s Guayasamín was commissioned to create La Capilla del Hombre, The Chapel of Man, in Quito. He designed the architecture of the building and created the murals and paintings displayed within it. The project was halted in 1999 when the artist died, but today, adjacent to the chapel is the Guayasamín Foundation, which the artist established in his name in the late 1970s. In the courtyard outside the chapel stands the Tree of Life, where Guayasamín is buried. The artist dedicated the Capilla project to the fight, heroism, sacrifice, and victory of Latin American people. Whether or not you agree with his politics, it cannot be denied that his works make you feel; that standing in a quiet room amongst these colossal images of human suffering would be an intensely emotional experience. In that sense, Guayasamín gave a contemporary and reinvigorated voice to the culture of an entire hemisphere. Click image to enlarge. 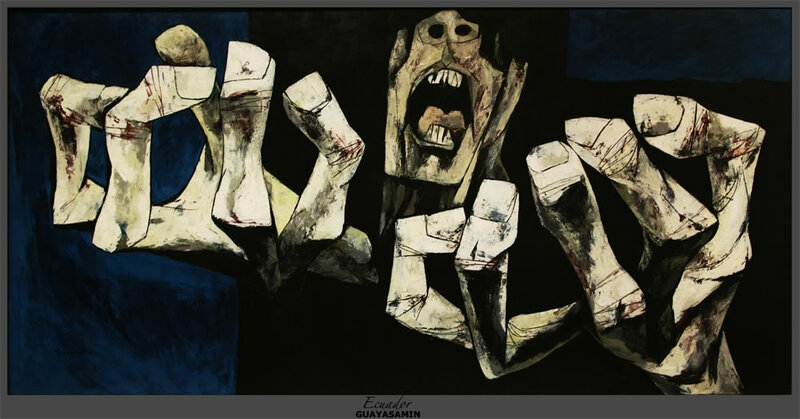 Oswaldo Guayasamin (Ecuadorian), Lagrimas de sangre (Tears of Blood), 1973, Capilla del Hombre, Quito. This entry was posted on January 7, 2015 by KristyDurk in Contemporary, Ecuadorian, Expressionism, Latin American, Mannerism and tagged Capilla del Hombre, Chapel of Man, communism, contemporary, Ecuador, Expressionism, Fidel Castro, Guernica, humanity, indigenous, Latin American, Latino art, Mannerism, mestiza, mural, Oswaldo Guayasamin, Pablo Picasso, Quito, South American, Spanish Civil War.